Bridal Showers. Baby Showers. Weddings. Christenings. Anniversaries. Do you have an event coming up that could use a corsage? Save money and time and by making your own!! Call me old fashioned, but I love wearing a corsage. There is just something so feminine about them. I especially love to wear a corsage on Mother’s Day to church (This year, I was the only mother wearing one!!). But actually, if you think about it, there’s lots of occasions where a corsage is appropriate and cherished. Besides Mother’s Day, there are showers, weddings, and anniversary parties where wearing a corsage adds a special touch for the one being honored. 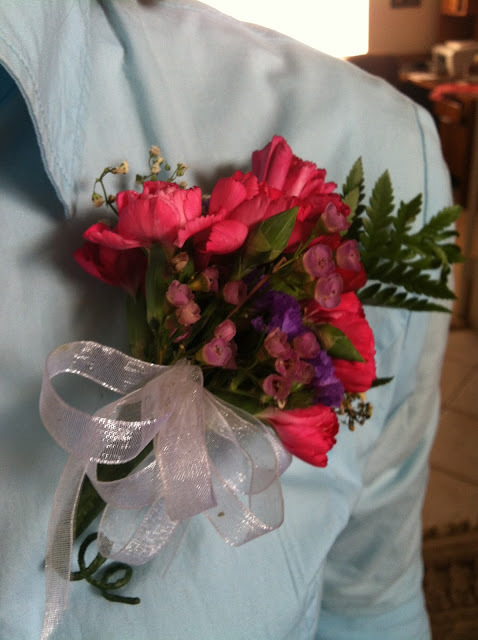 And how fun to present a handmade corsage to wear rather than a purchased corsage from a floral shop. 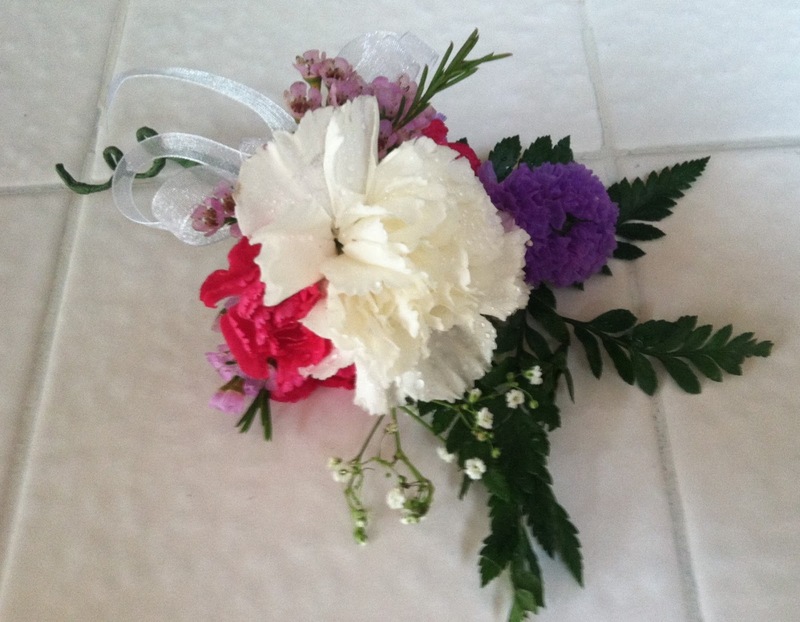 Making your own corsage is easy, fun, and very cost effective. I actually first learned how to put a corsage together when I took a floriculture class in high school. I had totally forgotten that I had taken the class until a friend had asked me to help make corsages for her daughter’s wedding. Under the tutelage of an experienced flower lady and dear friend, I relearned the skills not used for many years. It was so much fun– and gratifying too!! Step 1: Choose the flowers you want to use and prepare them for the corsage. Cut off stems to within a quarter inch of the bud. Insert a piece of wire through the bottom of the bud and twist to secure. Leave about a six inch tail of wire below the bud. Beginning at the base of the stem, wind floral tape around the wire until you get to the bottom of your wire tail. Repeat for each of the flowers you will be using. 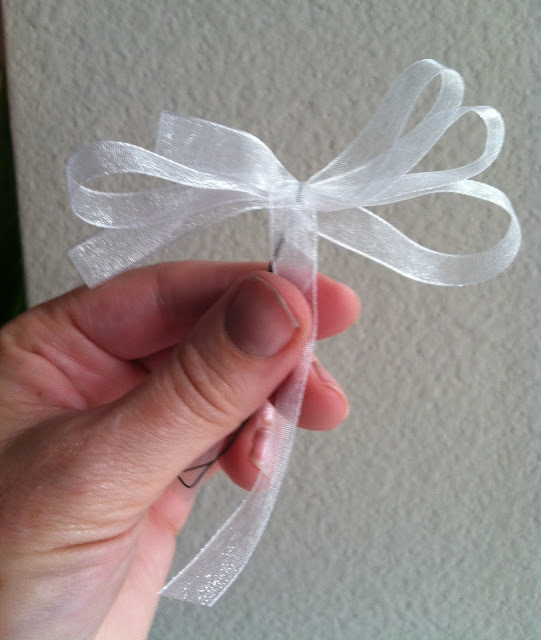 Step 2: Prepare a ribbon bow. Make six to eight loops, from right to left, having each set of loops bigger than the set before. Secure by twisting some wire in the middle, leaving a tail of about four to six inches. Step 3: Assemble the corsage. Biggest flowers in the center. Fill in with baby’s breath and put fern to the back. Don’t forget to add the ribbon at the bottom. Wrap all stems together with floral tape. With the remaining wire tail, wrap it around a pencil and pull off, forming a twisted vine at the bottom. Mist with water to keep fresh. Step 5: Packaging. Corsages can be made up to 2 days ahead of time. Just make sure they are kept refrigerated. Since I was giving mine away, I wanted them to look professional. 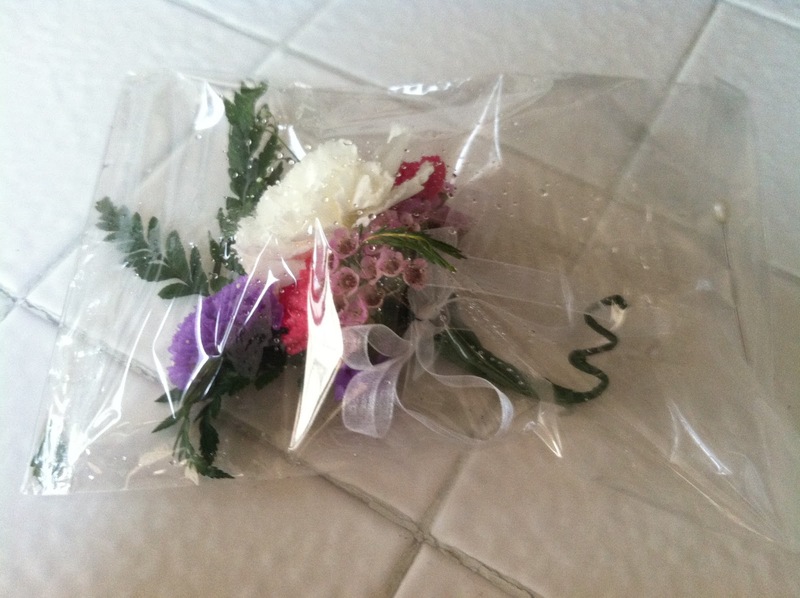 I found some cellophane bags I had on hand, opened them up, and misted the inside with water before putting the corsage inside. I folded over the closure and secured it with the floral pin—just like if I had bought it a floral shop!! 1) Buy your flowers wholesale –not retail. You can find great buys at Costco, Sam’s Club, even Trader Joe’s. 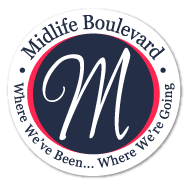 Better yet, Google a wholesale flower distributor near you. I bought an entire mixed bouquet plus an extra stem of the purple filler flowers for just $10!! The mixed bouquet had baby’s breath and fern included so I didn’t have to pay more for those items. Of course, if you have flowers in your garden, that would be better yet. 2) Use an odd number of flowers. That was the only thing I really remembered from taking that floriculture class 40 years ago. I don’t remember why that is so; some sort of design principle. All I know is that you are supposed to use an odd number. 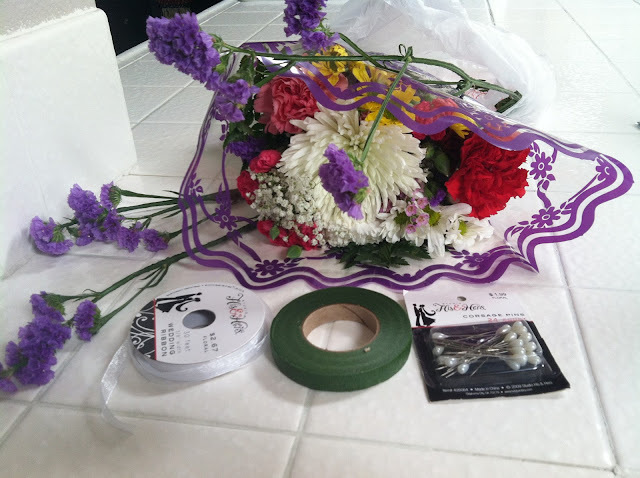 3) Use coupons–You can buy all the floral supplies (tape, pins, wire, ribbon) at Michael’s, JoAnne’s, or Hobby Lobby. Each of these locations have weekly coupons so that brought down my cost even further. I spent about $10 for these supplies. So, for just $20, I made six beautiful, stylish corsages. It would have cost me at least $25 per corsage if I had bought them at a florist. 3) Check Your Wire. Not all floral wire is the same. You want 20 gauge. I originally bought a higher gauge and it was too flimsy to go through the flower buds so I had to go back and buy more. 4) Boutonnieres are just a smaller version of a corsage. 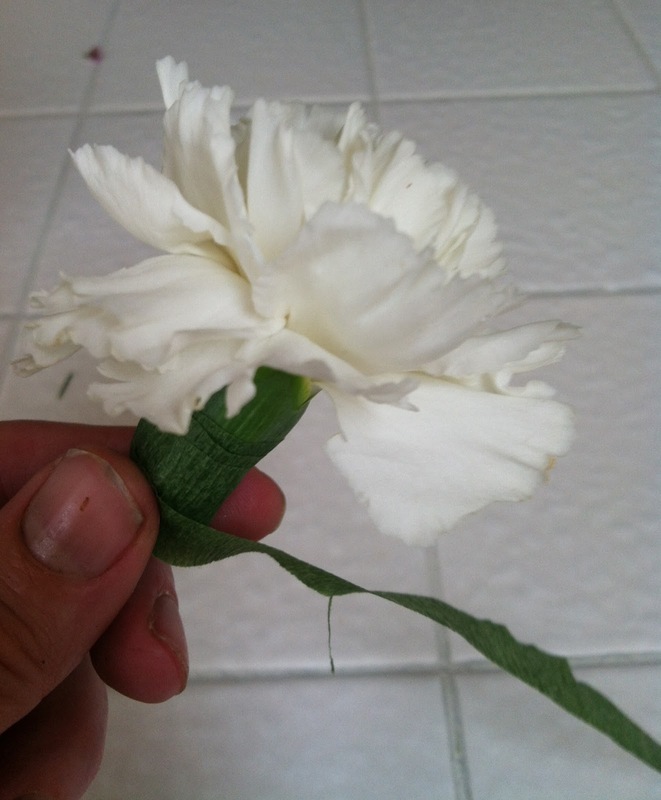 Use the same steps as with a corsage, just with one big flower or three small ones. Not sure how to wear your DIY flower corsage? Or looking for some unique ways to create your DIY flower corsage? I came across these additional tips from FTD. Knowing how to create a flower corsage or boutonniere can really come in handy. Not only to save money, but to create a unique design all your own. Presenting a guest of honor with a corsage or boutonniere on their big day just makes a special occasion all the more special. What upcoming event can you make a DIY flower corsage for?